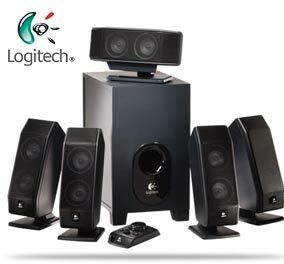 Sound quality form the Logitech-X540 are fantastic, I upgraded from its little brother the X-140 and ohh what a difference, I could hear things in my music, games and movies which on my older speakers didn’t appear. I do however have a Creative X-fi card so this may add to the brilliant sound quality. Setting up the speakers really couldn’t have been easier, all the cables have colour coded ends so you really can’t make any mistakes, there is a Manual included but it’s not really needed as setup is that easy. All the speakers have a swivel base that twists 180 degrees and also allows them to be mounted on a wall. To give you an idea how loud these speakers are, I had the volume just under half way up and i could go downstairs in the kitchen with the door closed and still hear them. I give this Set a solid 9/10, they are of fantastic quality both build /sound quality. Its only letdown is those few short cables. Front Left & Right Speaker cables are too short. Wired Remote control cable too short. This thread can be discussed further here.